Also, my last slide (slide #20) did not make it. In the moment, I panicked thinking I miscounted my slides, so I ended abruptly. But I didn’t miscount. My slides were cut short due to a technical issue with the computer. So in the spirit of a Quantum-Leap/Back-To-The-Future-type ambition to put right what once went wrong, I will go through how I would have wanted it to end. …Now I encourage you all to take your own journeys. 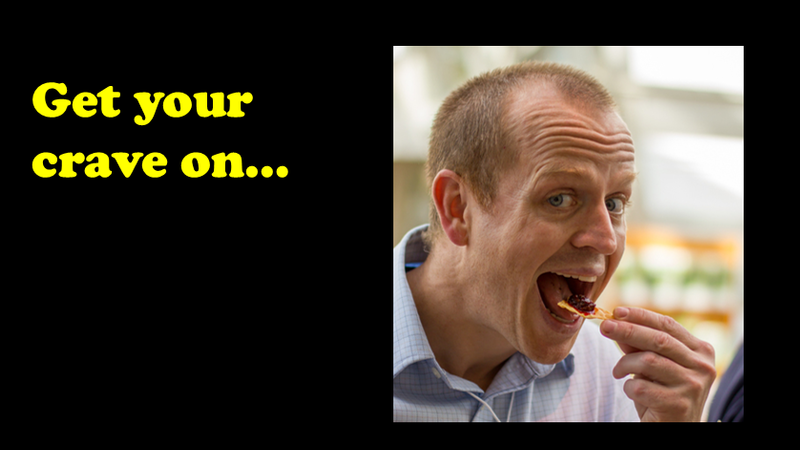 Because eating bugs is not so weird, most of the world already does it. And it’s sustainable and paleo, and kosher, and gluten free, and no more grosser than many things we eat now. 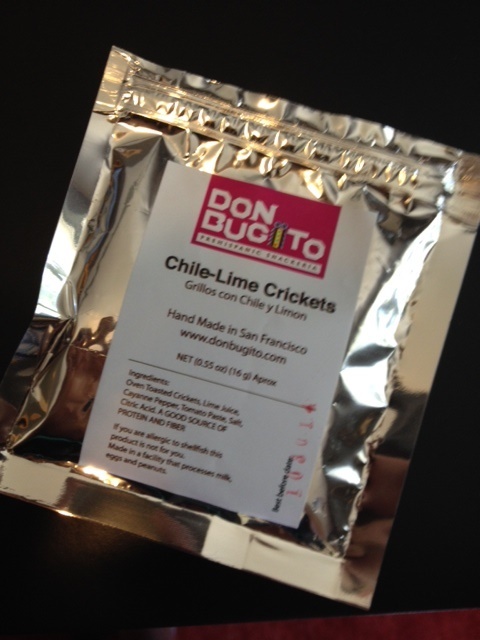 And there are now bars with cricket protein, and a cricket flour you can bake with, and resources with the Eat-a-Bug Cookbook and Daniella Martin’s Edible. 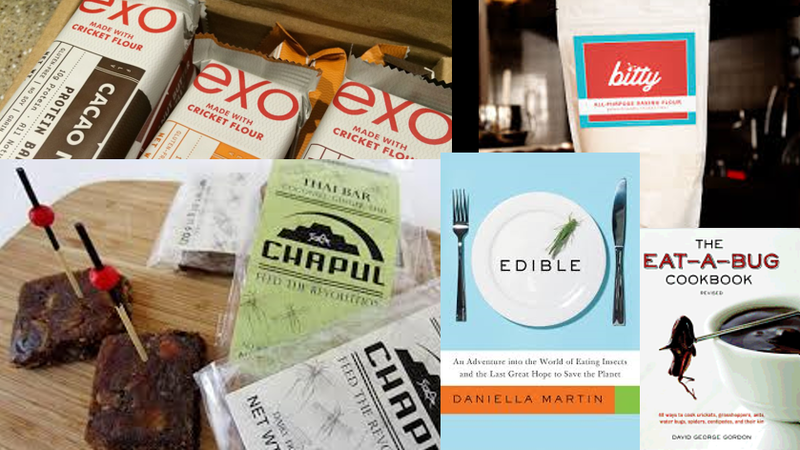 I wanted to conclude by making clear that there are way more palatable edible insect foods out there now than what I made with my own cooking, like energy bars from Exo and Chapul, savory snacks from Don Bugito, candies from Hotlix, and cool flour and baked goods from Bitty Foods. Many thanks to the folks at Ignite and Sustain Dane for putting together such a cool night of folks talking sustainability from a variety of fun and unique angles. Check them all out here. And also thanks to Cheri Schweitzer, top-notch Madison restaurant consultant of Credible Consulting, food safety expert, and instructor for WWBIC’s very worthwhile “Business Planning for Your Food Business,” who recommended I try to do this thing. There is a great article in the July 28th New Yorker overviewing the concepts and history of the paleo diet movement as writer (and environmental expert) Elizabeth Kolbert goes full paleo for her family for a week. With Kolbert’s entertaining and informative flair, she runs through the highlights and arguments for the paleo diet (namely, how agriculture is the worst mistake man has ever made…an idea popularized in the landmark piece by Jared Diamond). Whether or not agriculture was the worst mistake in the history of the human race, the choice, once made, was for the good. With a global population of 7 billion people, heading rapidly to toward 8 billion, there’s certainly no turning back now. Pound for pound, beef production demands at least 10x as much water as wheat production, and, calorie for calorie, it demands almost 20x as much energy…All of which to say that, from an environmental standpoint, paleo’s “let them eat steak” approach is a disaster. I wonder if she conferred with her New Yorker counterpart Dana Goodyear, who’s awesome 2011 article on entomophagy got me thinking about the whole bug thing. I’ve already written about the sustainability advantages of insect husbandry over traditional forms of animal protein production. But I’m only now realizing how well bugs fit in the paleo lifestyle. I’m not super into paleo, but I do the Crossfit thing and it’s inevitable that you get introduced to the diet at your local box. I agree with a lot of paleo principles and did try going full paleo for a month. It took a lot of adjusting with me doing a lot of cooking and working with a lot of new grocery (coconut flour… who knew?). After going through a sluggish period of what I can only understand as “gluten-withdrawal,” I felt awesome and lost a few pounds. Although I continue to try new paleo dishes and limit my intake of processed flour (but not sugar… holy moly I have a problem there), ultimately it’s a pretty time-consuming, repetitive, and expensive diet to maintain whole hog. Insects were most definitely part of the original paleo diet. Cavedudes were more likely crunching on cicadas than they were on bacon-wrapped avocados. But a cricket that is straight-up simply roasted with a little chili-lime flavoring might prove to be a very “sustainable paleo” offering.